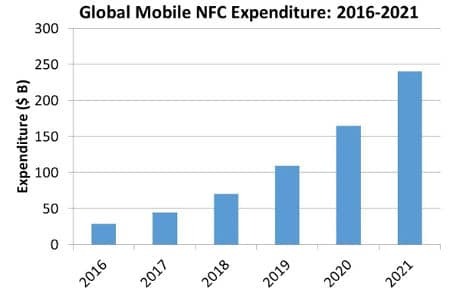 More than 100m people around the world will use an NFC handset to make a purchase this year, according to a new report from Strategy Analytics, and the value of transactions conducted via NFC handsets will grow from US$30bn in 2016 to US$45bn in 2017, US$70bn in 2018, US$110bn in 2019, US$160bn in 2020 and US$240bn in 2021. “Rising overall adoption of contactless payments will boost handset-based contactless payments, but underlines a strong need for mobile wallets to differentiate from cards,” the authors of ‘Mobile NFC Payment Forecast Update: 2004-2021’ add. Strategy Analytics is encouraged by rising use of contactless payments over the past 12 months, particularly in cities like London where the acceptance of contactless payments has become nearly ubiquitous, says Strategy Analytics’ Nitesh Patel. “Handset-based contactless payment needs to go beyond the convenience offered when paying by contactless cards,” Strategy Analytics’ David Kerr adds. “The success of non-NFC based mobile payment services from Starbucks shows that combining loyalty and offers into mobile payment applications provides incentive for users to switch to mobile wallets. Interested to know more about the SE Asian markets adoption of NFC payments. Definitely less than then more developed markets, but Singapore and HK have been using NFC solutions for payments for some time. Maybe Asia will adopt faster.